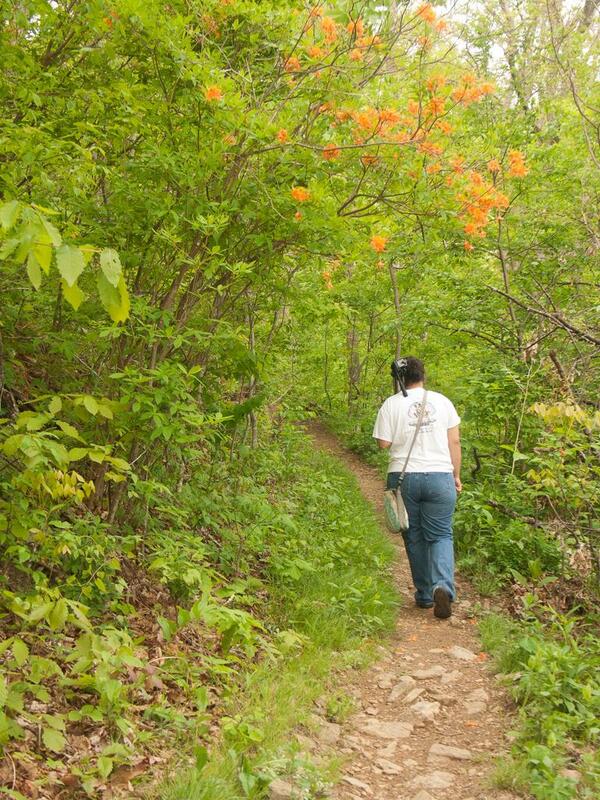 This pleasant hike takes you to the ruins of a historic private lodge along a section of the Mountains to Sea Trail. It's close to the City of Asheville, making it a nice option if you're in the area and don't have a lot of drive time. A well-designed trail goes through a multitude of switchbacks, following an old wagon road which was built to reach the lodge. Explore the old toolshed, the tennis courts, or the water supply pond, now long since grown over with thick, lush, Appalachian forests. 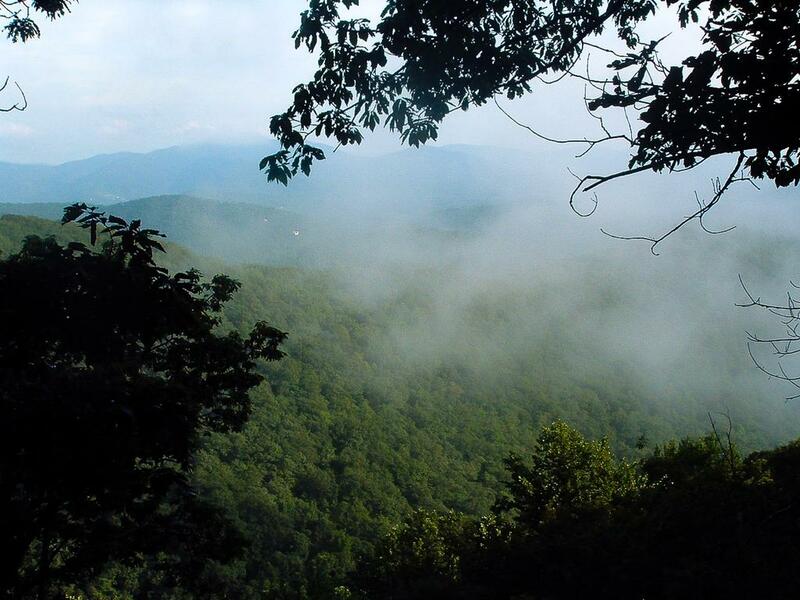 From Asheville, take the Blue Ridge Parkway north, from any of its access points, to the intersection with Ox Creek Road. It's about 6.2 miles north of the Folk Art Center. Turn left. The parking area is on the right after 0.9 miles. It's just big enough for about 3 or 4 cars. If this area is full, you may park where the Mountains to Sea trail first crosses Ox Creek Road near the Parkway - adding about a mile and some climbing to the hike. If you're coming from Weaverville, the parking area will be on your left about 1 mile past the "zero curve" switchback. Don't be concerned by the name of this hike - you won't be visiting a snake's den! In fact, your chances of seeing a snake on this hike are no higher than any other, which is to say fairly slim. 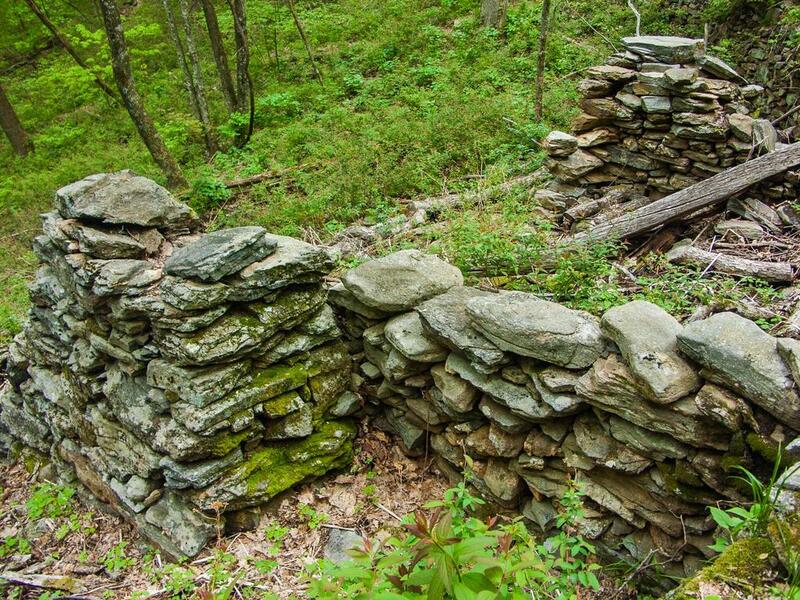 Instead, you'll hike on a moderate, well-graded path to the remains of an early 20th century retreat, built by one of WNC's historically affluent and conservation-minded citizens, Dr. Chase P. Ambler, which burned in 1926. The old carriage road to Rattlesnake Lodge starts its climb from Bull Gap via these switchbacks. The trail is now the Mountains to Sea Trail, and the way to Rattlesnake Lodge. Begin the hike behind the large boulders at the back of the parking area. About 140 ft from the parking area, there is a triangular intersection; turn left onto the Mountains to Sea trail. There are no other intersections all the way to the old lodge, and you'll be following white circular blazes. 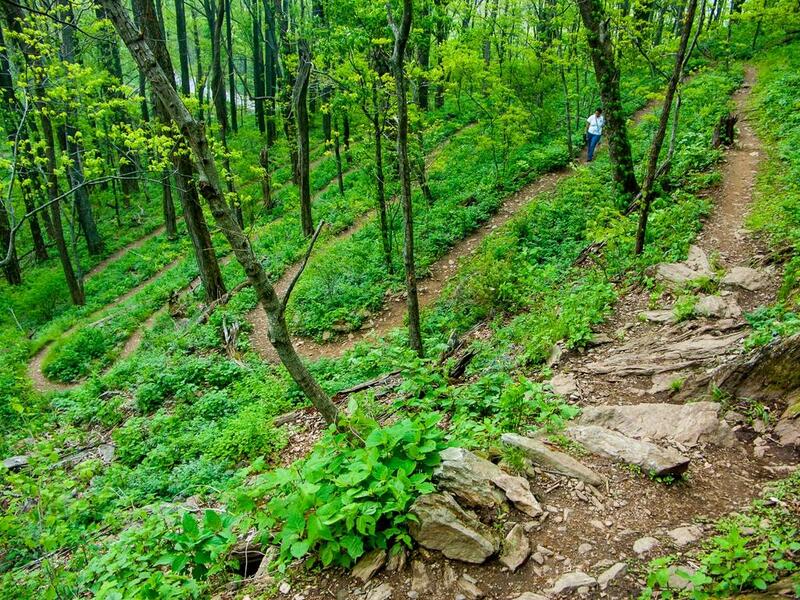 You will begin by ascending the rounded end of Bull Mountain on a trail that goes through a half-dozen switchbacks for the next 0.2 mi, climbing so gradually that you'll scale all of them before you even begin to break a sweat. At the top, you can look downhill and see the path as it swings back and forth across the slope below you. Don't cut up the slope across the switchbacks! Flowering dogwoods arch over the trail in places, and bloom in late April to early May. The forest here at the beginning consists of tall, straight tuliptrees and other hardwoods, with jewelweed, stinging nettle, and a wide variety of other wildflowers covering the forest floor. Poison ivy also grows just off the trail in abundance at this fairly low-elevation site, so be careful when hiking in summer months. 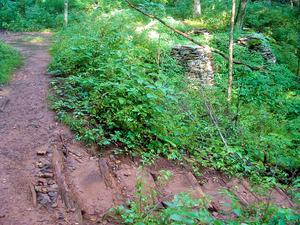 The trail surface is generally smooth with just a few roots and rocky sections to keep your attention. 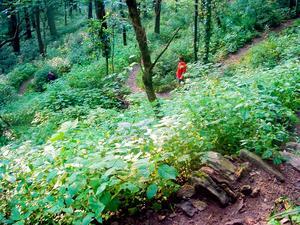 After the top switchback, the trail will round the ridge of Bull Mountain. Bull Mountain, Bull Creek and Bull Valley were all named for the last individual of the eastern variety of elk - a bull - which was shot in this valley many years ago. The elk have since been reintroduced into the Great Smoky Mountains National Park, and may once again roam these Great Craggy Mountains if they are successful and wander far enough. This trail was built to last, and on many sections impressive dry-stack stone retaining walls still remain. Other sections go by large rock outcroppings. Look for large, leathery looking lichens growing on the rock. They resemble wilting lettuce leaves and are black on the back side. A symbiotic relationship between an algae and a fungus, these are rock tripe lichens, and they are edible in an emergency when boiled. They are rubbery when wet and crackly when dry. 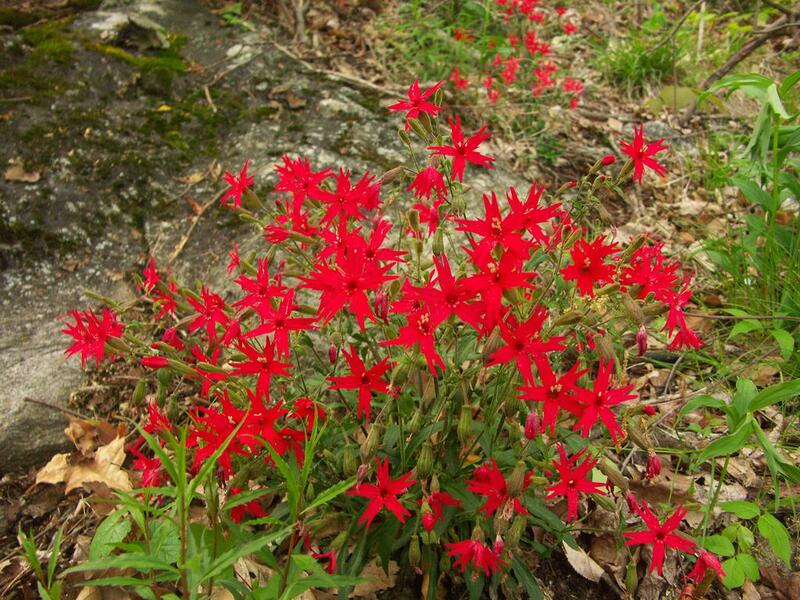 Feel them, but don't break them or pull them off, as they take a very long time to grow - and here on Blue Ridge Parkway property, they're federally protected. Dry-stacked retaining wall along the trail. About 1/4 mile past the switchbacks, you'll reach another switchback, to the left. In another 1/4 mile, the trail traverses a mountainside made of solid rock, and some sporadic views of the Bull Valley open up to your right. For about the next 0.3 mi past the view, you'll dip into a cove and back onto a small ridge. Notice as the forest quickly transitions into predominantly oak trees - some having twisted into grotesque forms - with an understory of mountain laurel. Rounding the ridge, you'll curve into a slight cove and begin to climb some more. The ridgeline oak forest will gradually transition back into cove hardwoods - mostly tuliptrees - as you approach the lodge site. 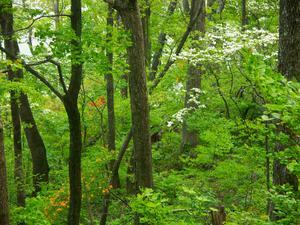 Some sizeable trees grow here, making for a very pleasant forest to hike through. 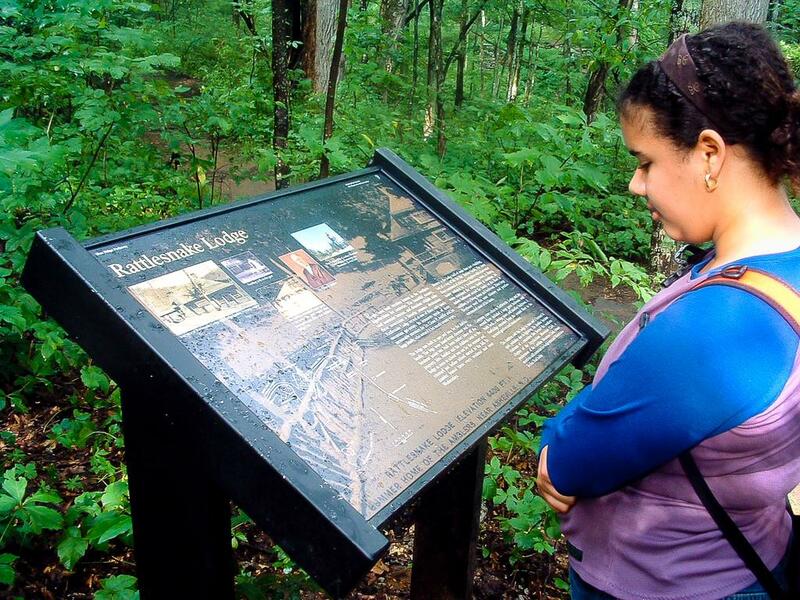 About 0.3 mi past the ridge, you'll see the first sign that you are on the grounds of the old lodge: a building foundation (the old barn) appears on the right side of the trail. Shortly thereafter you will reach the old swimming pool, which was fed by cold mountain water through an underground delivery system. Then the main lodge building, marked by a (now dead) huge old oak tree, stacked-stone wall and flat yard area. There's a display board showing a map and historical pictures at the corner of the old yard. It shows the main lodge building along with some of the outbuildings and descriptions of them. Look at this sign for a better view of what the old foundations scattered around you used to be, and a good history of the site. Continue a few feet past the main building location and you will reach an intersection. The trail leading right meets up with the Blue Ridge Parkway at the Tanbark Ridge tunnel about 1/2 mile down the mountain. You can come to the lodge site that way, but I think the hike from Ox Creek Road is much more pleasant, as it's longer and a lot less steep. Just past the blue-blazed trail is where you find perhaps the most interesting remains of the old estate: a spring house on the left and the foundation of the old tool shed on the right. 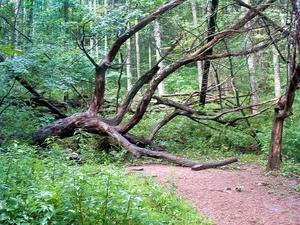 A huge, twisted, fallen oak tree partially blocks the path to the old spring house. The crooks of its branches make for great climbing and sitting spots, so if you're in need of some relaxation - bring a book and spend some time here! 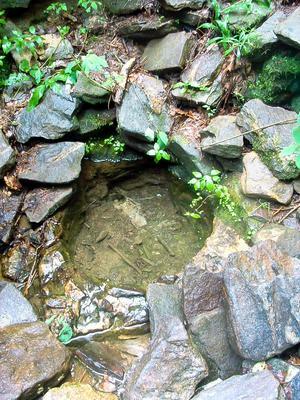 You can duck under the arch of the main trunk of this tree to see the remains of the spring house and the spring itself, which is a crystal-clear, circular pool rimmed with rocks. The water comes up through sand on the bottom and is always cold, and it once ran through the floor of the building to make food storage areas. Stick your water bottle down in the pool (closed, of course - the water shouldn't be considered safe to drink), and by the time you take it out you will see why the spring water was once used to refrigerate items such as eggs and milk! A hydroelectric generator sat in the area underneath the shed. The tool shed's old stone foundation. A hydroelectric generator sat in the area underneath the shed. The twin pillars of rock to the right of the main trail mark the downhill corners of the toolshed. A small spring branch runs over the retaining wall here when the water is high. A hydroelectric generator in the tool shed once gave power to the lodge - the water coming not from this spring branch, but from the main reservoir located higher up in the next drainage south. The additional elevation was needed to make enough water pressure for the lodge and generator. Dr. Chase P. Ambler, who built the lodge as a summer home in 1903-1904, was a prominent Asheville physician and conservationist. He is credited with being one of the founders of the movement to establish Great Smoky Mountains National Park, and groups backing passage of the Weeks Act in 1911 which eventually led to the creation of Pisgah National Forest. He was chairman of a committee that eventually lead to the creation of the Carolina Mountain Club, which is still active today and has a big role in building and maintaining the Mountains to Sea Trail, making the conservation of the lodge site by the Blue Ridge Parkway and the trail running through it a fitting tribute. For more information about Dr. Ambler and his family, the lodge, and its history, visit http://www.rattlesnakelodge.com/, a site maintained by a coalition of Ambler's descendents. The main Lodge area normally marks the end of this hike, but to extend the hike on a beautiful loop of trail and visit another spring and the lodge's old water reservoir, continue hiking on the Mountains to Sea trail over a level course beyond the lodge. You'll cross a small branch of Bull Creek. Beyond that creek crossing, the trail passes the site of the old corn crib, potato house, and stables (which show no visible remains anymore) and the caretaker's cabin (which does have the remains of a chimney still standing), about 0.1 mi from the main lodge. 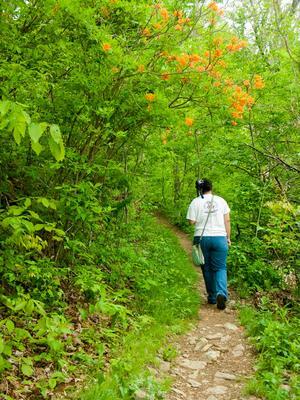 The trail then climbs south past the chimney, through a wet area, and onto a rocky section of trail beneath arching mountain laurel. At an opening in the forest, another very narrow view of the Bull Valley opens up on the right. 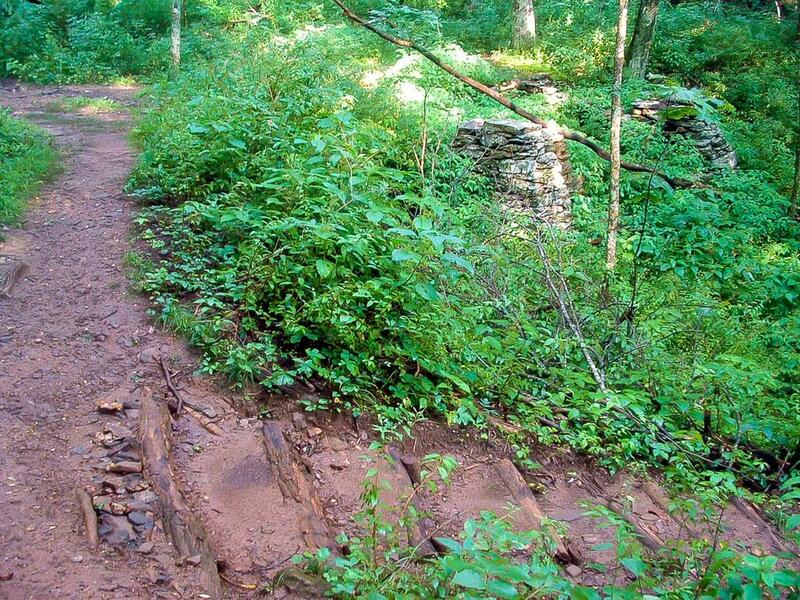 0.3 mi from the old chimney, the trail goes through a rocky switchback to the left and starts climbing northeast, along a rocky course that passes in and out of mountain laurel thickets. 0.35 mi past the switchback, the trail reaches another spring, on the right. The Mountains to Sea trail continues straight here; turn left, downhill, onto the blue-blazed trail. The spring once fed the reservoir located 0.1 mi downhill. The blue-blazed trail descends steeply along the old terracotta pipeline to the reservoir structure on the right. In addition to the piped spring, it was also fed by the stream at the reservoir site. Past the reservoir, the blue-blazed trail continues 0.17 mi down to the circular spring at the lodge site and the Mountains to Sea trail. From the lodge site, head back down the Mountains to Sea Trail toward Bull Gap to get back to your vehicle. Jordan M. said: @stephanie nixon - I'd say it's likely ok right where it comes out, but after sitting stagnant in the pool exposed...mmmm, not so much. That's why there used to be a spring house over it! Not a great idea to try and find out as the consequences (sickness) could be quite severe. Many people in the mountains do use spring water (piped and sheltered) for a drinking water source, but it's always wise to have it tested! stephanie nixon said: Dip your water bottle into the spring? 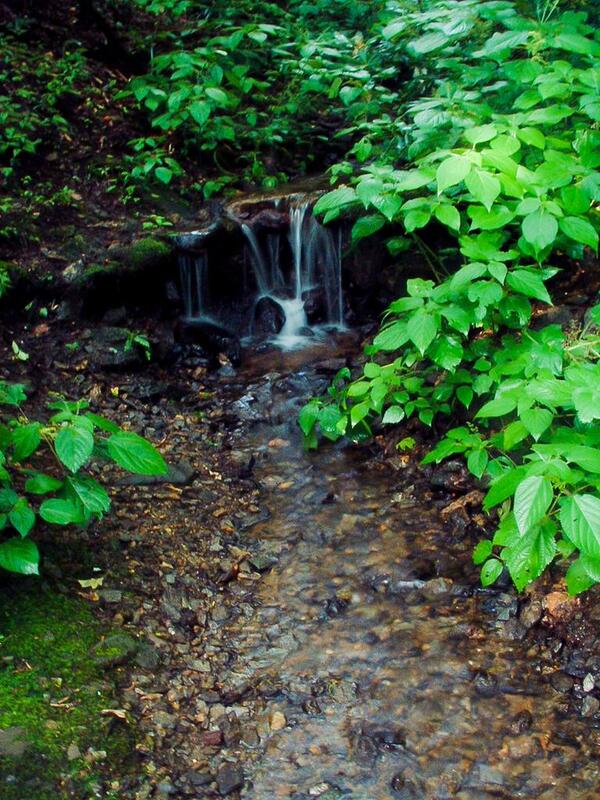 This is one of my favorite hikes and I have always wondered if the water is ok to drink. Last month, I found a frog swimming in it and a dead chipmunk next to it. Has anyone had this tested? Id love to. Jordan M. said: @Cola, you're right, the MST ends at Jockey's Ridge. I even knew that and wrote it wrong anyway. We've updated the description. Thanks! Jeff Weston said: PS the peak I am talking about is the one on map at 4800 feet, north of the lodge along the trail. You can see on map how trail goes just right of the peak. At the right time of year the moss on the north side of the mountain makes it seem like the Hobbit village. Cola said: Just a small correction to "and eventually its termination on the Outer Banks on Hatteras Island". The MST actually ends at Jockey's Ridge in Nags Head; a towering summit of @ 90 feet above sea level, the tallest and biggest sand dune east of the Mississippi and quite a distance north of Hatteras Island. Now I'm off for a quick afternoon hike to Rattlesnake Lodge! 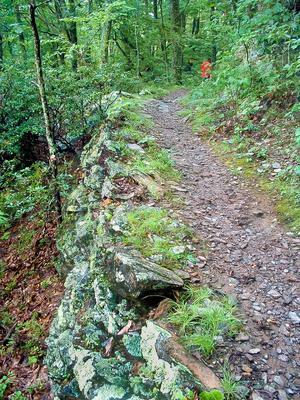 Joyce said: We hiked this trail a few weeks ago while we were visiting Asheville. We took Tunnel Rd. out of Asheville, got on the Blue Ridge Parkway and travelled north. After about 6 miles we didn't see a road sign on the Blue Ridge Parkway for Ox Creek Road but turned left at the sign pointing to Weaverville. It immediately ran into Ox Creek Road where we turned right and found the small parking lot easily in less than a mile. 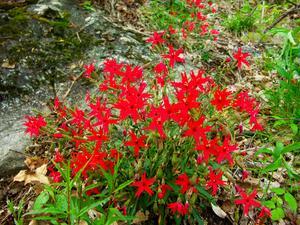 Beautiful scenery and very pleasant hike...trail is well maintained. I highly recommend this hike. Jordan M. said: Ryan - whoops, you're right, I'm not sure where that came from. It's about 6.3 miles. Thanks - we've fixed the directions! Ryan Spruill said: Not 8.9 miles north of folk art center unless my odometer is broken. Maybe 8.9 kilometers. It was somewhere on the order of 5-6 miles. Suzi said: This was our first hike since moving to Asheville. It seems to be a popular trail. The hike itself was long enough to feel like you had actually done something but not too tough to wipe you out for the rest of the day. The trail seems to be popular but is exceptionally clean. Jerome Johnson said: Can you PLEASE tell me how to get these images, i.e. myTopo, Map, to show up on a Google Map? I am just a wayward beginner. Thanks. 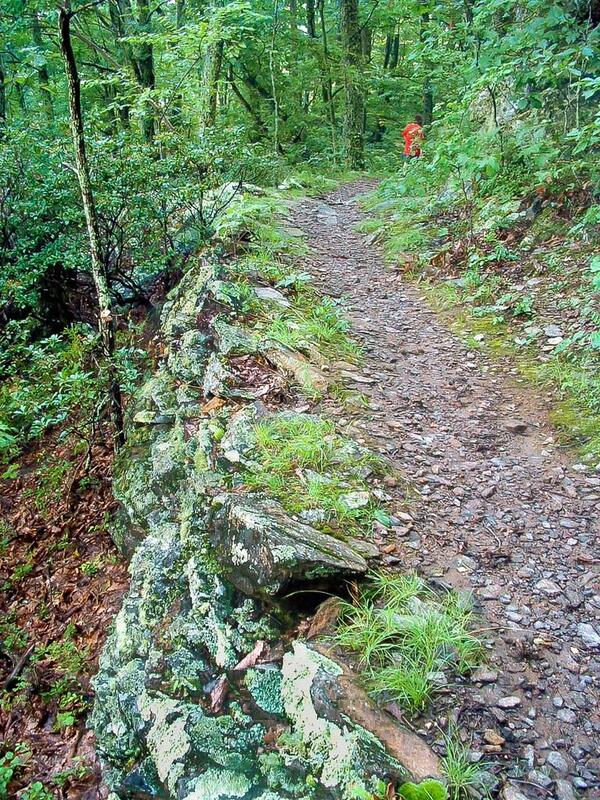 Gary said: A popular trail due to it's close proximity to both Ashville and Weaverville. Easily accessed from BR Pkwy, but road closures along Pkwy in winter and early spring can require you to access from Weaverville. 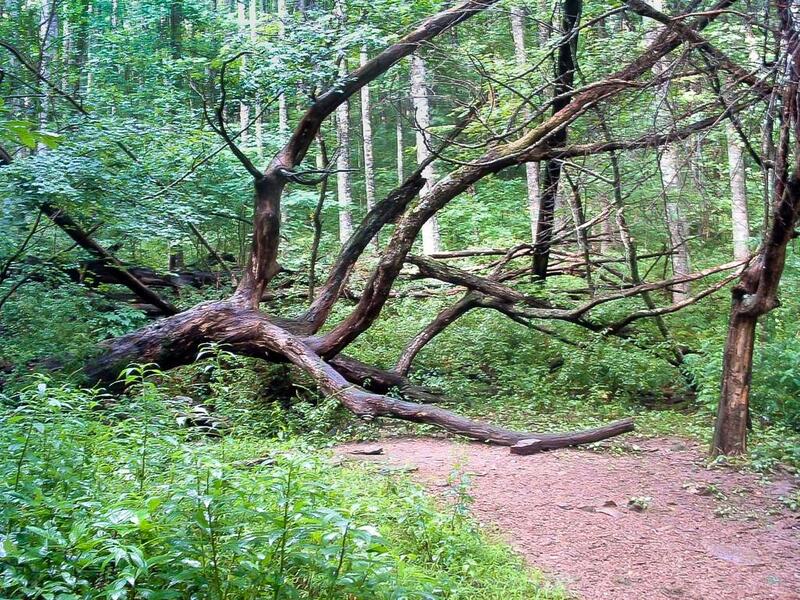 The trail is currently block by down trees in a few places, but nothing major. Great day hike, expect lots of others if the weather is nice. 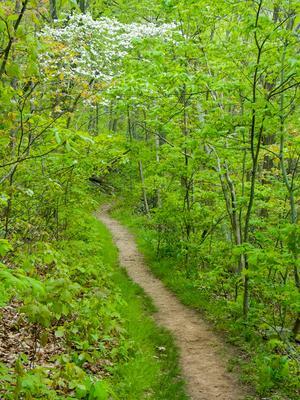 Matt said: It's a pleasant, easy-to-moderate hike that stays away from the roads. The destination is cool, particularly if you know the history (www.rattlesnakelodge.com). But neither the hike nor the destination are anything too special. What makes this hike worth it are it's beautiful woods, and conveniently close location. A good day hike that doesn't take all day, or take it all out of you.